[S778] Marriage - Fluker, David T and LeVangie, Barbara. [S871] 7 Apr 1930 US Census, unknown repository address. [S782] 12 apr 1940 Federal Census, unknown repository address. [S782] 12 apr 1940 Federal Census, unknown repository address, James Ventura was single in 1930 but married with a son in 1932. [S900] Cincinnati Enquirer, 1 June 1958, 1. 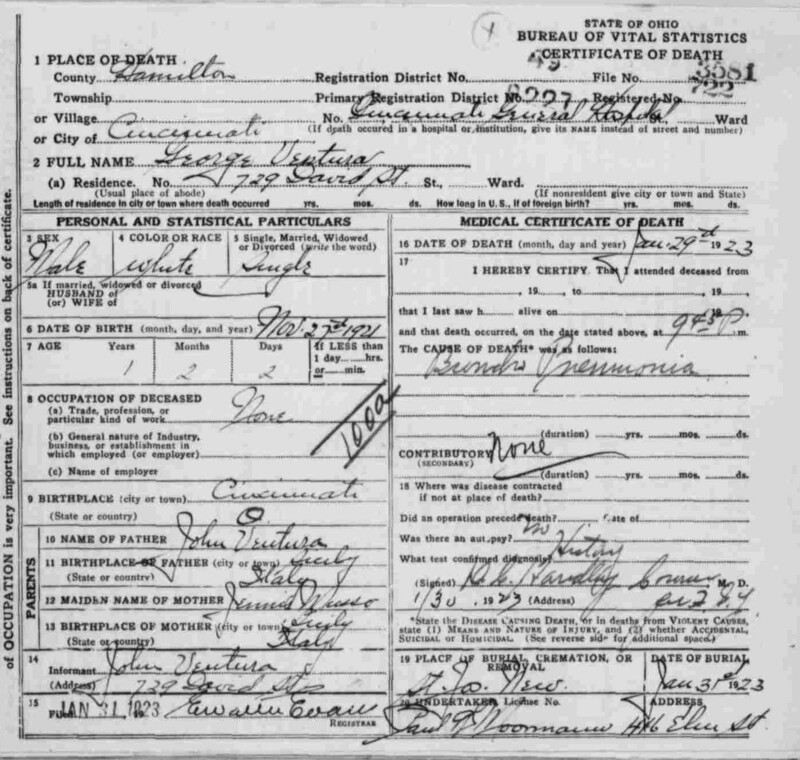 [S782] 12 apr 1940 Federal Census, unknown repository address, age 8 born in Ohio. 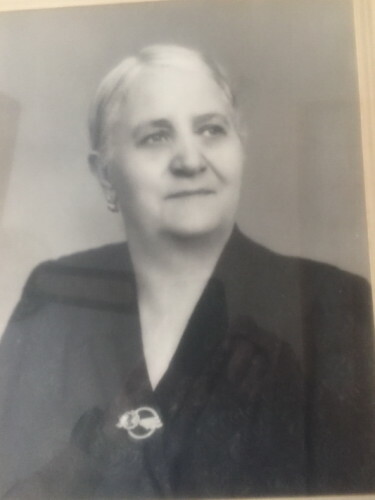 Georgina Ventura was born on 12 September 1888 at Caccamo, Palermo, Sicily, Italy.1 She died on 14 March 1954 at Philadelphia, Philadelphia, Pennsylvania, USA, at age 65. [S449] Census 1910, NY, NY. [S822] Unknown repository Application for Naturalization (20 Jun 1917), unknown repository address. [S821] Giovanni Rosario VENTURA, Virginia Ship Manifest, 22 Oct 1909. [S449] Census 1910, NY, NY, lived one apartment away from brother John Ventura. [S793] Termini-Imerese Database, online http://www.termini-imerese.org/, FHC Film number 2014479 document number 13. [S793] Termini-Imerese Database, online http://www.termini-imerese.org/, FHC Film number 2014636 document 139. [S754] Find-a-Grave, online http://www.findagrave.com, Find A Grave Memorial# 155610625. Find A Grave Memorial# 155610625. Find A Grave Memorial# 129228545. As of 31 July 1949,her married name was Ventura. 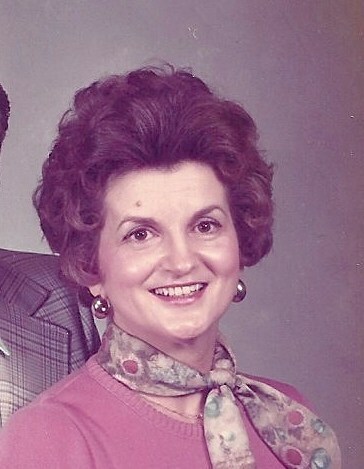 Eleanora Jo Nicastro also went by the name of Jo Ventura. Jack Melvia Abbott was born on 24 October 1925 at Newport, Campbell, Kentucky, USA. He married Lema Loretta Pace, daughter of Thomas A Pace and Marcia Barrett, on 2 September 1948 at Newport, Kentucky, USA. Jack Melvia Abbott and Lema Loretta Pace were divorced on 13 December 1967 at Cincinnati, Hamilton, Ohio, USA. Jack Melvia Abbott married Maymie F Royce on 29 June 1968 at Fort Thomas, Campbell, Kentucky, USA. Jack Melvia Abbott died on 8 February 2007 at Cincinnati, Hamilton, Ohio, USA, at age 81. [S1055] 1 May 1940 Federal Census, unknown repository address, Year: 1940; Census Place: Newport, Campbell, Kentucky; Roll: T627_1289; Page: 16A; Enumeration District: 19-4, Head, William Abbott, est. birth 1884male, white, born KY, Married, Head of household, occ. Solicitor. [S1055] 1 May 1940 Federal Census, unknown repository address, Year: 1940; Census Place: Newport, Campbell, Kentucky; Roll: T627_1289; Page: 16A; Enumeration District: 19-4. Lema Loretta Pace was born on 29 January 1931 at Kentucky, USA. She married Jack Melvia Abbott, son of William Abbott and May Reder, on 2 September 1948 at Newport, Kentucky, USA. Lema Loretta Pace and Jack Melvia Abbott were divorced on 13 December 1967 at Cincinnati, Hamilton, Ohio, USA. Lema Loretta Pace died on 5 July 1983 at Cincinnati, Hamilton, Ohio, USA, at age 52. Lema Loretta Pace was also known as Leema Pace. As of 1948,her married name was Abbott.